NEXUS didn’t vex us, it spun us into breathlessness. Nexus shattered all preconceived notions the audience might have held regarding percussion music. The selections by Steve Reich and Toru Takemitsu generated a range of emotional material from meditative to enchanting sounds. Reich, and generally music of the minimalist approach, requires much concentration. Being able to delight in maintaining individuality, while also being able to move and feel the resultant combinatorial musical landscape is difficult. The men of NEXUS wasted no time in delving directly into the intricacies of combined patterns. This energy was again evident from the opening moment of the Takemitsu, heralding a series of special musical textures. 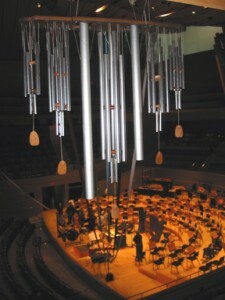 Beginning with flue five-note motif (the main theme of the musical material), the five soloists processed in from the audience playing several antique cymbals. “From me flows what you call Time” is replete with subtle references to nature, and Takemitsu is said to have composed it especially with the different personalities and musical styles of the Nexus percussionists in mind. It was fascinating to hear them play the number and variety of instruments from around the world, The Australian rain stick, Tibetan bells and Turkish gongs were just a few that transported the audience. With so many special world percussion instruments, one might expect to hear “all but the kitchen sink.” However, Takemitsu has provided a composition that is spun rahter than fabricated. It uses subtle contour and gradual build to create a modern impressionism. At one particularly beautiful visual as well as aural moment, we were suspended breathlessly when two Nexus members gently tugged at five brightly coloured ribbons attached to large wind chimes hanging from the balcony on either side. This is a terrific ensemble, world class musicians. The concert last night in Syracuse was FABULOUS!!! Nexus members played magnificently. Thank you for updating your website to include Syracuse, & so much information about the SSO’s current difficulties.